Laneways of Melbourne is a photographic and historical journey through the often by-passed laneways of the city of Melbourne, and includes the South Wharf and Docklands precincts. The lanes have history and secrets that remain unknown to most of Melbourne's population and visitors. We hope this book enables readers to discover some hidden delights. 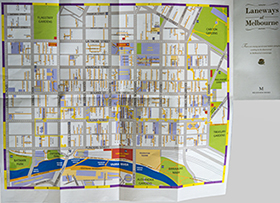 Each lane has its restaurants, bars, cafes and coffee shops listed. This is the third book in the series 'Portraits of Victoria' with updates and additional lanes in the second edition. 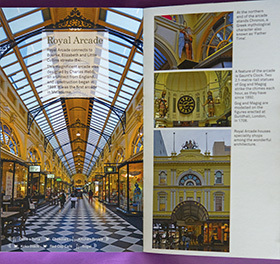 Melbourne's unique arcades and laneways offer a mecca of places for people to explore, socialise, shop and eat. Fashionable boutiques, coffee and cake shops, tearooms, bars, restaurants and alfresco dining enhance a warm street ambience enjoyed by many. Laneways of Melbourne presents vibrant street art, fascinating history, secret locations, popular restaurants, chocolate and cake shops, cafes, clubs and much more.